First, a reminder of what my old cutting table looked like. The actual table had a center part with one drawer and two large leaves that folded up. You will see the center part of this table reborn in a future post. The supports for the leaves were like frames with legs that swung out from the base. I was able to store large bins or these craft cubbies under the leaves, but anything placed behind the supports was awkward to reach. Small bins or other items could be stored in the center section on the back side, but I would have to move the whole table to get to them, which meant moving most of whatever else I had on the floor. Urgh! Take note of all the stuff on top of the table. Some of this was because I was mid-purge when I took the photo. However, this was not really that unusual, either. It was pre-cluttered with sewing odds and ends that didn't have better homes. The table had become an easy spot to just drop stuff to deal with later, and since it was in that little room, it was easy to ignore. You can guess how that worked out. 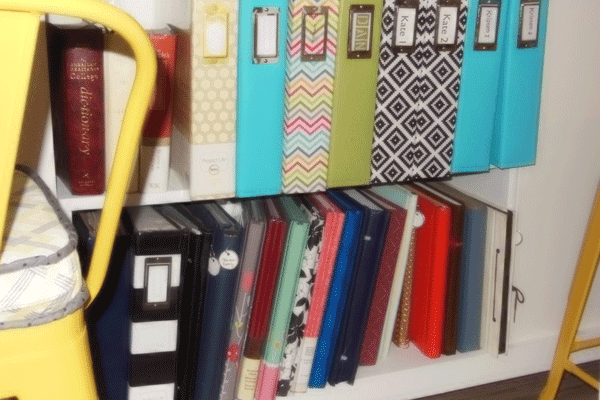 When there was something to work on, I would have to first take care of all the clutter, and sometimes that task was too overwhelming, so the project never was started. I knew that I needed a cutting table that was sturdy and that had a lot of storage built in. I had decided in my redesign that I would cut back on storage racks, and would need a new way to store my fabrics. Also, it would have to be affordable. 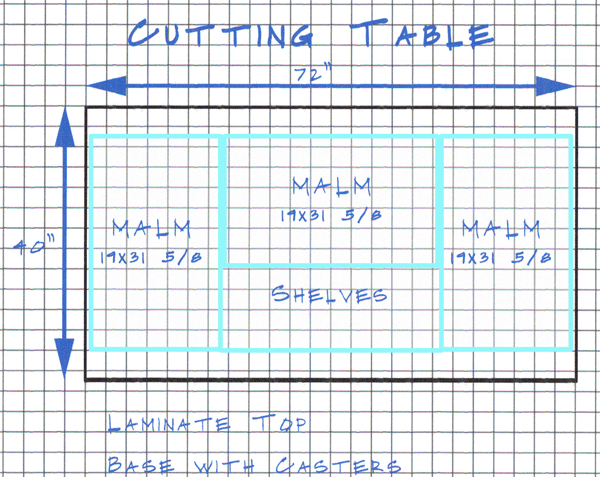 I looked at a lot of DIY designs for cutting tables on Pinterest. 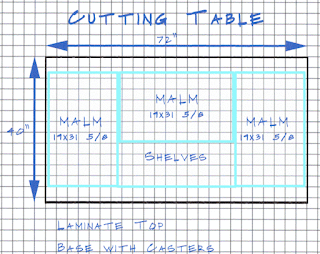 Using the ideas I got there and the dimensions I wanted for my table, I started drawing out plans. Here you see my final plan. I shopped a lot of dressers, looking for height, drawer depth, and ability to fit them within the plan. The IKEA Malm dressers were the best fit, and so affordable! When I drew out my plan with these dressers, I knew that I would have an unfilled space in the center of one side. This could have been a problem, but it was providence! I had known that in addition to fabric storage, I would need adequate storage for my scrapbooks. Those things require sturdy and deep shelves. Perfect! Two shelves—actually the base and one shelf—would be just right! 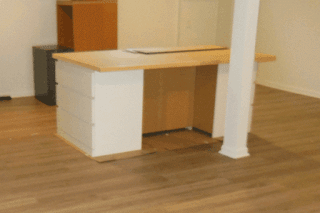 Since the table would have a support post right behind it, drawers would not have worked out anyway. Once I had my dressers and my plan, I handed it all over to TNDK Remodeling to do the work. Clever, huh? 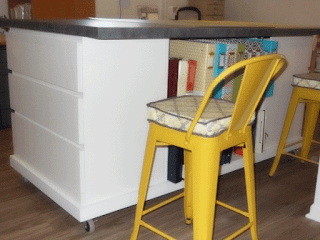 They built a sturdy base with casters and painted it to match the walls. The dressers were assembled. 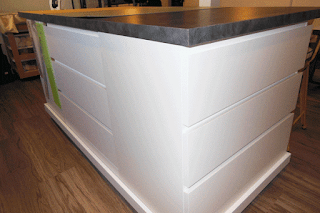 The top was built, then finished with laminate (Wilsonart® Laminate, Pewter Brush). This picture shows the dressers and the unfinished top. The base was in the garage to be painted. Finally, it was all put together: dressers on base, top on top 😀 , shelf installed and painted. The top is not glued on, so that if we needed to move the table, it would be simple to take apart. The top extends about 8 inches on the bookshelf side, another bit of providence. When I discovered that, I knew that adding a couple of bar height stools would make it a perfect spot for sitting and crafting. Here is a view of the finished product from my desk. I'll have a tutorial on those seat cushions in an upcoming post. This is where I sit to eat a quick lunch or stand to work at my computer when I'm tired of sitting. The granddaughters use these seats when they're coloring or crafting. Moving to the left, I'll show you what's in the drawers. 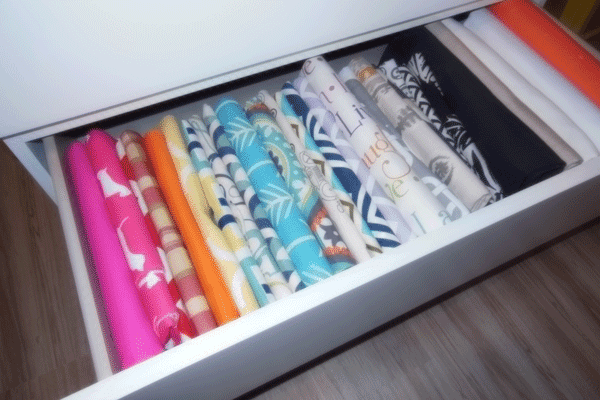 This top drawer holds my wovens. 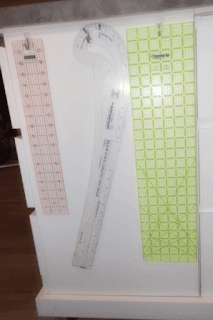 These are mostly a yard or less and suitable for quilting, though I don't quilt much. The great thing was that I was able to lift the folded fabrics from the bins that were storing them and place them right in the drawer without refolding! That was a real time saver. 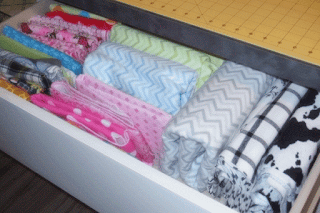 The next drawer down holds wovens, as well, but most of them are larger cuts. 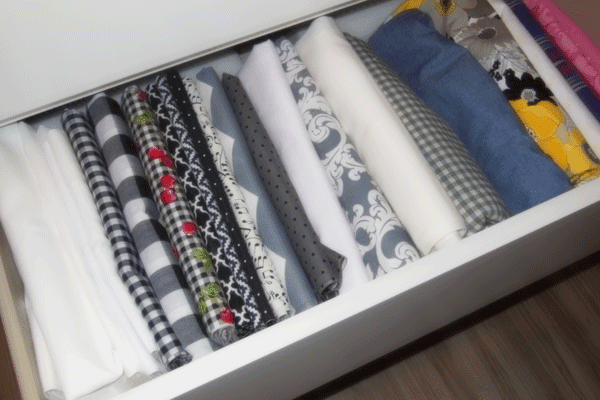 The bottom drawer holds wovens that are home dec. weight or canvas, and mostly cuts longer than one yard. Moving to the left brings us to the side opposite the shelves. 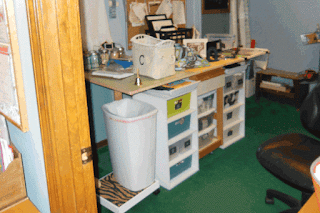 This side faces the craft and sewing tables, and it is where I stand to cut fabric, draw or trace patterns, work on large crafts, and load scrapbooks. The top drawer holds elastic, zippers, velcro, bias tapes and piping, blanket binding, and the tools I use for cutting and tracing patterns and fabrics. Here are some closer views. 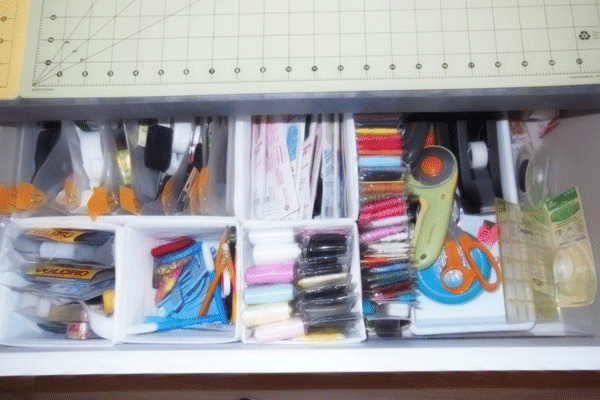 I used drawer organizers from IKEA, one plastic drawer bin, a homemade holder for the bias tapes and piping made from trimmed cracker boxes and duck tape. 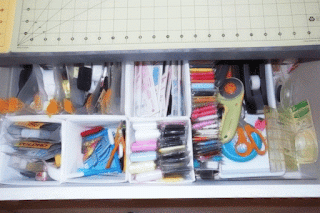 The tools section has paper scissors, fabric shears, rotary cutters, tape, and pins. You also see a six inch square cutting rule. 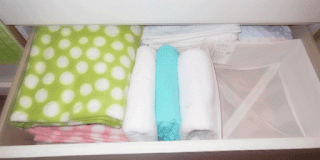 The right side of the drawer has blanket binding in a bin with zippers behind it. One drawback of these Malm dressers is that the drawers do not pull out all the way. Using these bins, it is easy to pull out a front bin to get to one in the back. The small bin in the center has pencils, fabric markers, scissors, and pattern weights. The small bin on the left has velcro. The bin of elastic looks like a jumble here, but it really isn't. 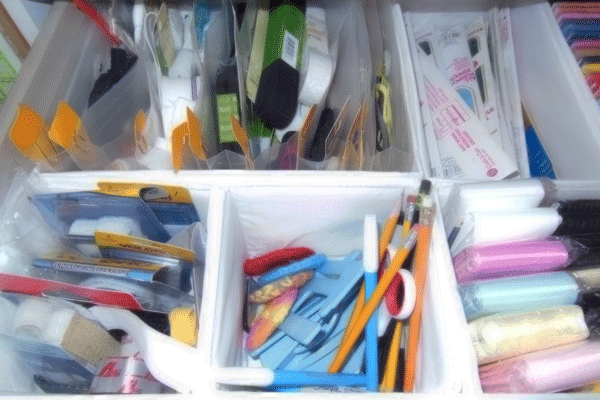 In a large square bin, I have plastic envelopes, like one might use to organize bills or coupons. I've sorted the elastic by type and/or width into these envelopes, then labelled the envelopes with these little paperclip tags. 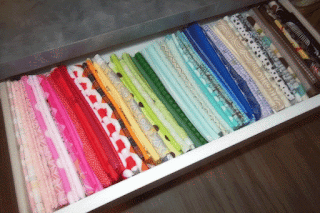 The middle drawer holds (clockwise from top left) ribbon scraps, fabric strips and a quilting jelly roll, ribbing, cording for making piping, window treatment supplies, and ultrasuede scraps. Look for a post about using ultrasuede for easy applique, coming soon. 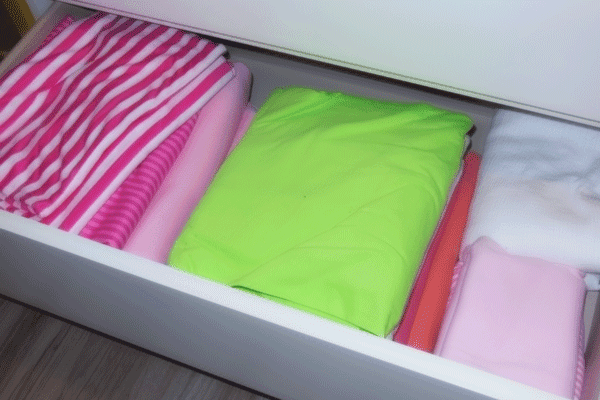 The bottom drawer actually has some empty space! It also has fleece, terry, prefolded diapers, and some Minky fabric. 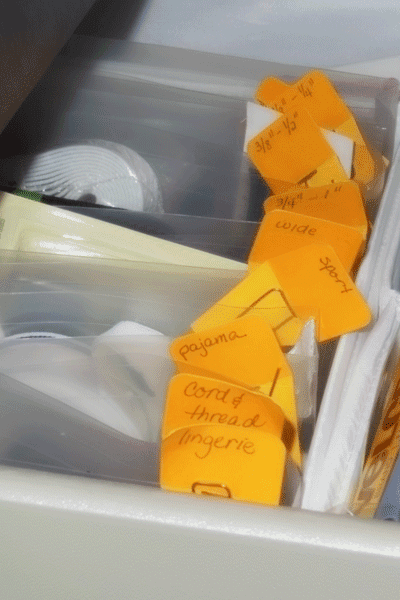 To the left of these drawers, I used Command hooks to hold three of my rules. 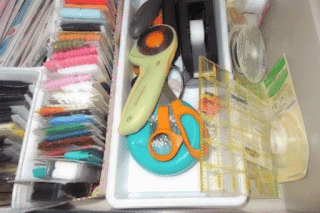 The one I use most often doesn't have a hole for hanging, so I keep it in the front of the top drawer when I'm not using it. Moving to the last set of drawers, this top one holds flannel. The pink pieces in the middle are some scraps of fabric bonded to fleece. They are fun to use to make Scrappy Monster Dolls and other crafty things. I had a ton of scraps like this, but these are the only ones that made the cut when I was purging. 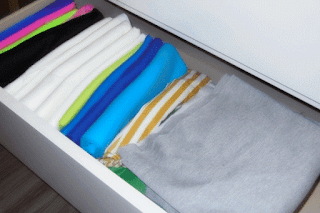 The middle drawer holds knit fabric: swim fabric, interlock, french terry, and sweatshirt fleece. 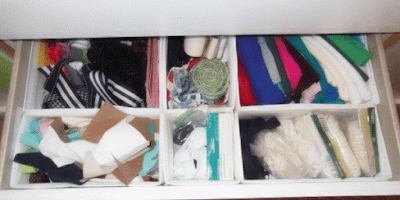 The bottom drawer holds more cuts of interlock and jersey knits. Finally, here is a view of the large cutting mats that I use. 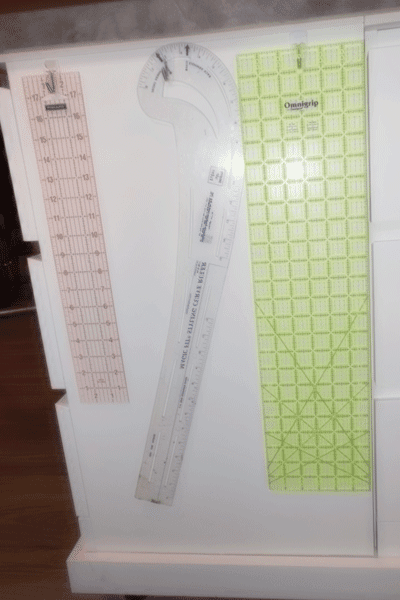 Besides being useful for cutting fabrics, they sometimes protect the table surface when I'm doing some crafting. I keep the mats connected with duck tape on the back side. The mats are reversible, so I could tape this side, flip them over and remove the other tape if this side becomes to worn. I have found that it's pretty easy to keep this table from becoming too cluttered. 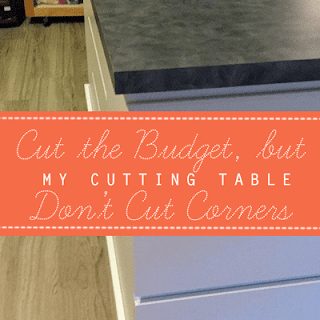 The table is right there, in the center of the room, and any clutter nags at me to put things away or to finish that project, already! 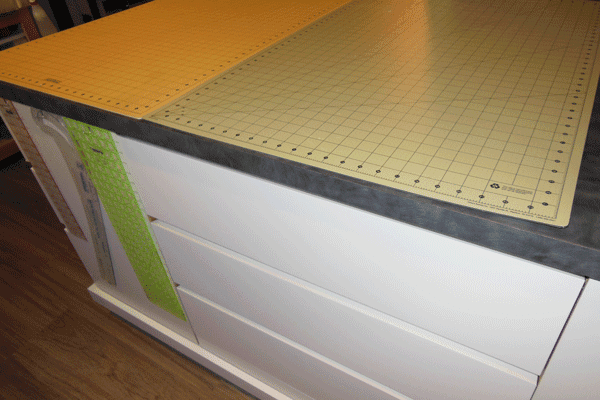 But it is so much easier to start and finish projects when I have this beautiful, clear, work surface. And it's easier to put things away now that everything has a home. 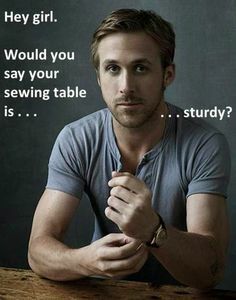 There you have it: my gorgeous, fabric-licious, handy and handsome cutting table, kind of like this guy. Thanks for hanging in there for the tour! Be sure to leave me a comment, suggestion, or question! They Hey Girl Meme is perfection. I am always amazed by your expertise. Thanks, Kristen! I think a little humor makes everything better.